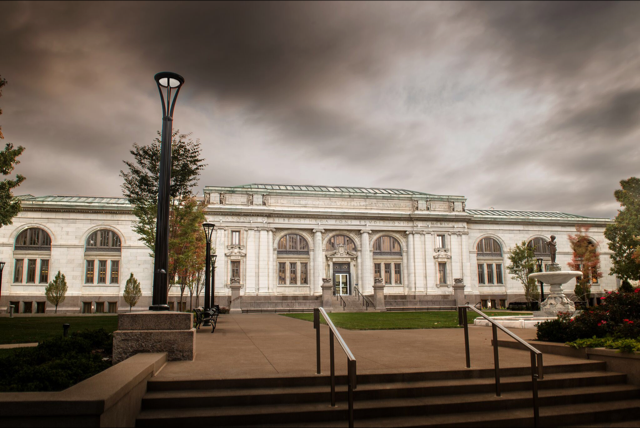 The Columbus Metropolitan Library Main Branch has been an iconic building in the city since its original construction in 1907. This project provided major upgrades to the facility, technology systems, and user experience while preserving the historic architecture and character of the building. The project included over 250,000 square feet and took place over a 12 month schedule. Work included an all new fire alarm system, (2) new generators with ATSs, new paralleling gear, new interior and exterior LED lighting, lighting controls, building automation, several new electrical panels, new branch, new audio system, new service for fire pump, and support for other mechanical systems. Nearly all of the new electrical systems were installed in conduit. A key challenge on this project was working within a historic building and preserving the original materials. The Carnegie Building is nearly a century old and the new library features the building’s architecture as a major part of the design. This required research on and use of special building materials to accomplish the preservation goals. As a high occupancy public building, this project included a significant fire protection system. The system was installed in conduit throughout the facility. A detailed fire protection impairment program was established because the building was occupied by Library personnel throughout the duration of the project. The high profile project had many stakeholders who were actively involved in the process. This required our team to respond quickly to accommodate several additions and changes which occurred throughout the project.